(Bloomberg) -- WikiLeaks founder Julian Assange was expelled from his hideout in Ecuador’s embassy in London and charged in the U.S. with conspiracy, ending his seven-year standoff with British authorities and launching what could be a protracted battle to bring him to the U.S. for trial. The 47-year-old, disheveled after a morning handcuffing, appeared in a London court where prosecutors said he tried to resist what he called an illegal arrest. In a day of rapid-fire developments, the U.S. unsealed a year-old indictment accusing Assange of a hacking conspiracy with ex-U.S. Army analyst Chelsea Manning to disclose classified government material. That March 2018 indictment didn’t address a more recent episode involving Assange’s WikiLeaks -- its publication of waves of emails that embarrassed Democrats during the 2016 presidential election, a trove that U.S. prosecutors have said were stolen during a Russian intelligence operation. The matter was a central part of Special Counsel Robert Mueller’s now-completed investigation into Russian election meddling. If Assange is extradited, U.S. prosecutors could question him about matters beyond the Defense Department hack, according to Michael Koenig, a former Justice Department prosecutor. “The government is always happy and willing to listen to the any information it can obtain regarding matters under investigation or potential matters under investigation," said Koenig, now a partner at Hinckley, Allen & Snyder. But Assange “comes with baggage, and you can expect his credibility to come under heavy scrutiny,” Koenig added. Before that can happen, the U.S. may face a pitched extradition battle with Assange’s lawyers. Such a process could stretch into 2020 or longer, extradition lawyers say. At Westminster Magistrates Court in London, Assange pleaded not guilty to allegations that he had resisted arrest and skipped bail. His lawyers assailed the U.K. courts, saying he couldn’t get a fair hearing in the country. 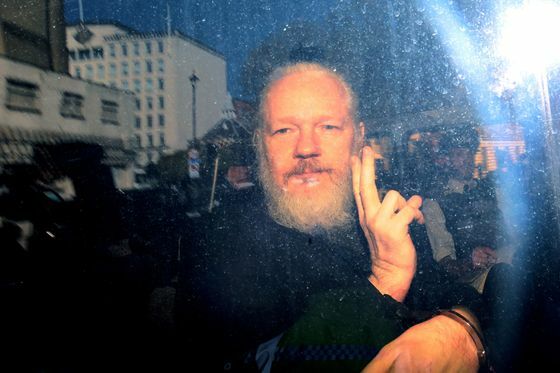 The judge dismissed the claim as “laughable” and called Assange “a narcissist who cannot get beyond his own selfish interest.” His first extradition hearing is scheduled for May 2. According to the newly unsealed U.S. indictment, Assange assisted Manning in “hacking a password stored on United States Department of Defense computers.” WikiLeaks published the cables starting in 2010, followed by other documents taken by Manning. Assange’s indictment brought relief to some in the media world because he wasn’t charged with espionage. Press freedom advocates have long cautioned that such charges against him for releasing government secrets would put a chill on the press. There was also celebration across the political spectrum. Lindsey Graham, a Republican senator, said Assange’s release of classified information “put our troops at risk and jeopardized the lives of those who helped us in Iraq and Afghanistan.” Senator Mark Warner, the Democratic vice chairman of the Senate Intelligence Committee, linked Assange to the Russian hacks. An indictment against a Trump ally, Roger Stone, provides clues to other questions that prosecutors may have for Assange. Trump campaign officials directed Stone to contact WikiLeaks during the period when the activist website was publishing the emails, which embarrassed top Democratic officials and Trump’s opponent, Hillary Clinton, according to the case brought by Mueller’s office. Assange’s arrest came after Ecuador expelled him from its embassy in London. He had been there since 2012, when he sought to escape questioning in a Swedish sexual-assault case. 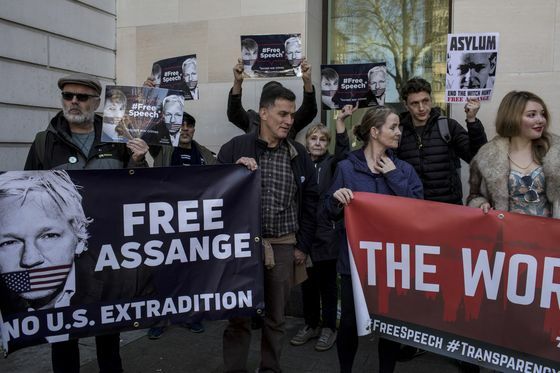 Those charges were dropped in 2017, but Assange remained in a small apartment in the embassy as he has continued to dodge U.K. police and American prosecutors. Assange drew worldwide notoriety in 2010 when WikiLeaks published the classified U.S. materials about the Afghan war that were stolen by Manning, a former U.S. Army intelligence analyst then known as Bradley Manning. Assange has said his activities were protected from U.S. prosecution because he acted as a journalist. The existence of a Justice Department case against Assange came to light on Nov. 15, when federal prosecutors inadvertently disclosed charges against Assange in an unrelated case. That filing didn’t detail the nature of the case against Assange. The newly unsealed indictment, dated March 6, 2018, accuses Assange of agreeing in March 2010 to help Manning crack a password on a Defense Department computer network that stored classified documents and communications. Manning, who had access to the computers as part of her duties as an intelligence analyst, gave a portion of the password to Assange to crack, storing it as a “hash value” in a computer file that she accessed using special software, the document said. Manning used the computers to gain access to hundreds of thousands of classified documents and transmit them to WikiLeaks. While Manning was stealing troves of data, Assange encouraged her to keep going, prosecutors said. They discussed the value of the Guantanamo Bay detainee assessment brief, after which Manning said, “that’s all I really have got left,” according to the filing. Because prosecutors say Assange conspired to help Manning acquire and transmit the classified material, her actions would play a central role in any trial of Assange. Prosecutors are now seeking more information from Manning, who spent seven years in prison. In recent weeks, they have tried to compel Manning to testify to a federal grand jury in Virginia. She has refused despite being granted immunity by a federal judge and the Army. Manning is behind bars again as she fights the subpoena in an appeals court in Richmond, Virginia. “Even assuming that Manning is correct that she will be asked about those offenses, such activity would fall squarely within the purview of a legitimate grand jury investigation,’’ they wrote. Manning was sentenced to 35 years in prison for violating the U.S. Espionage Act. After President Barack Obama commuted her sentence, she became an activist speaking on technology, artificial intelligence and national security issues. Assange faces as long as five years in prison. The next turn in his drama could come as soon as Friday, when Stone’s lawyers are due to file a motion to dismiss the case that Mueller’s prosecutors brought against him in the U.S.